Chloe (my daughter) adores being able to have "pretty" fingernails and toenails. I'm not a big fan of adult polishes as they aren't very safe for the little ones and the scent can be overwhelming! We still have our "girls time" and paint one anothers fingers and toes. However, I've been searching for safer polishes for Chloe to use. I recently contacted Piggy Paint and asked if they'd be interested in sponsoring a review and giveaway on my blog in which they agreed. The colors are vibrant and inviting, the scent doesn't seem to be strong, and the polish glides on smoothly. Let's not forget to mention that Piggy Paint is also all natural and enviromental friendly! Project Earth: Solar Power: A vibrant and bright yellow color. Project Earth: Radioactive Clear Nail Polish that GLOWS-IN-THE-DARK! As you can imagine, my daughter was delighted to receive such a fun surprise in the mail! Even more so that this time the package was for her instead of "mama", lol. Chloe loves the color selection and especially loves the glow in the dark polish. Being a nearly 9 year old girl who is actively into fashion, she enjoys colorful nail polish to liven up her wardrobe. Oh my, I have a future diva on my hands! Take a look around on Piggy Paint, you will be pleased with the color selection. No boring or dull colors like you see in most natural polishes for children, tweens, or teens. 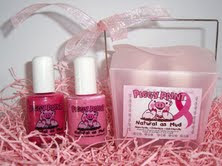 I am also pleased to share that Piggy Paint supports breast cancer with the Fight Breast Cancer Pack for $17.99. Contains 2 polishes (Forever Fancy and Angel Kisses) in a cute pink pail. Portion of proceeds goes to Susan G. Komen for the Cure. Water, water-miscible acrylic resins and thickeners (well below 100 parts per million), glycol ethers. May contain mica, D&C red lake, ultramarine blue, iron and titanium oxide pigments. •Wash hands with soap and water. •Apply 2 -3 thin coats of Piggy Paint™. •Blow dry polished nails for 1 minute with hair dryer set on warm heat/low blower setting. For safety purposes, please follow manufacturer’s instructions on blow dryer and always monitor your child. Since most young children are squirmy during the drying process of any polish, we suggest singing songs to pass the time. Two rounds of the “ABC’s” should make 60 seconds pass by very quickly. Make “Piggy Painting” a bonding experience for you and your child. Do I have to use a blow dryer to dry her nails? No, but it is recommended for maximum chip resistance. Since Piggy Paint™ is water-based and does not contain harsh chemicals, it takes longer for its ultimate hardness to be reached. The blow dryer just speeds up this process. Another alternative is to wait and polish your child’s nails after bath time, before they go to bed. This will allow the polish to cure overnight. 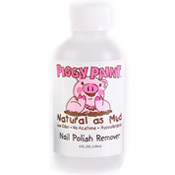 Why is Piggy Paint™ Nail Polish Remover the best choice? Put harmful, smelly polish removers behind you with Piggy Paint™ Nail Polish Remover, a remover that works quickly on all polishes, especially Piggy Paint™ Nail Polish. Our remover contains none of the solvents that could offend your nose or harm our atmosphere. Aloe Vera and Vitamin E are added to supplement the natural oils that protect nails and cuticles. Ingredients: Corn alcohol, butyl diglycol, Aloe Vera extract, Vitamin E, embittering agent. Like what you have read so far? How about a chance to own your own Piggy Paint? Read on to find out how! Don't want to wait and see if you are the lucky winner? Visit Piggy Paint to purchase your favorite nail polish colors! Use code: LITTLE10L for 10% off! This code expires on August 31, 2010. They ship world wide! One of my readers will win a $15 gift certificate to Piggy Paint! MANDATORY ENTRY: Must be completed before any additional entries will count. Take a look around Piggy Paint and let me know your favorite color! BONUS ENTRIES: Please leave a separate comment for each entry you complete. Each of the following are worth (2) extra entries (leave two separate comments). *Post a comment on a non-giveaway post and then come back here and leave a comment on which blog post. Disclaimer: I simply received a set of piggy paint polishes and have posted my own, personal and unbiased opinions. I hold no responsibility between you and the company, and/or products you may purchase or receive from them. I like Macaroni and cheese. I'd like the Little Miss Firecracker set since I was born on the 4th. Follow Piggy Paint on Twitter! Subscribed to Piggy Paint Newsletter! my fave is forever fancy. I like Candy Coated. Thank you for the chance to win. My favorite is clouds of candy color.